Hello Everyone Terre here with another creative card using Quietfire Designs amazing sentiments! For this particular card, I chose the "May Each Treasured Memory" stamp. Don't you just love how each of the sentiments you find here at Quietfire have just the right amount of curves and swirls, I think that is what draws me to them! You might also notice a couple of items from Spellbinders like the Butterfly Kisses M-Bossabilities and the Opulent Ovals die template you will find them right here at Quietfire Designs, who doesn't like one stop shopping? All The Queen of Hearts Winners! from the Queen of Hearts Challenge! Oh, this was hard. The styles were as varied as the styles of the judges! It even came to a tie breaker! We liked your clean simple style. Awesome! I'd like to give honorable mention (but sorry, no awards this year :-( ) to Charmaine (we loved your repurposing of the bathroom accessories) and Peggy Parenteau for her very unique stylish design. $75 worth of Quietfire rubber stamps! 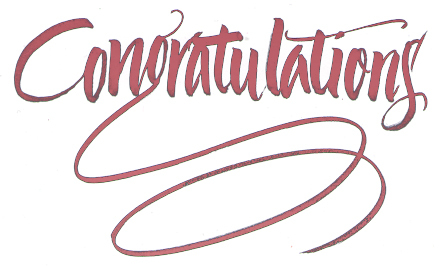 Here again are the winners of the Blog Hop Prizes. Thanks to everyone who took the time to create something and enter our challenge! P.S. Prizes will start going out this week. Sorry for the delay! Robyn here, having more fun than -(fill in the blank) I want to say barrel of monkeys- and how fun is a barrel of monkeys?--- a girl with a new technique. Holly's crumpled embossing technique filled me with "what ifs?". I used a combo of my favorite stamps and some I rarely use. 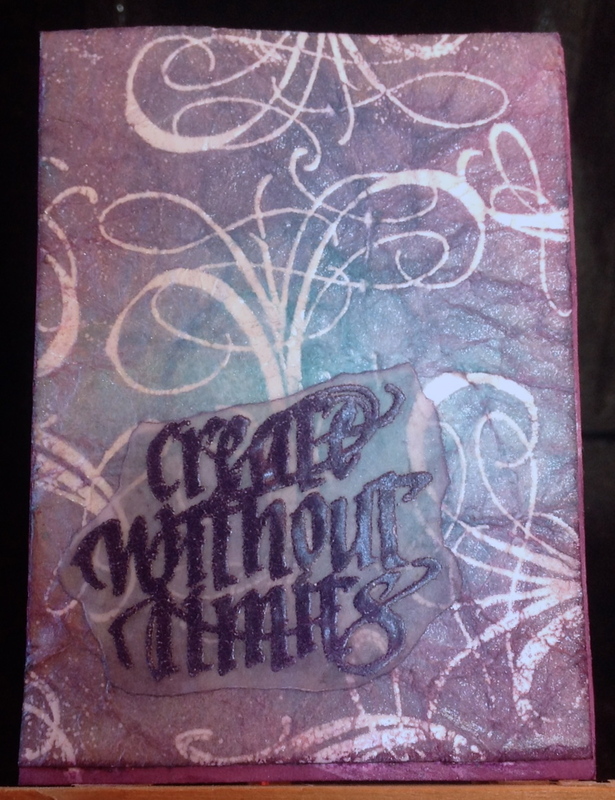 This ATC started with stamping the medium sized flourish with VersaMark***hint-have two pads-one that you keep perfectly clean for watermarking and one for general stamping(and be sure to clearly mark them***** all over the white card and thermal embossed clear. Forgetting to refer to Holly's excellant turtorial, I then added color, Distress blues and purples using the Ink blending tool. Then I remembered to crumple, misted the paper with water a bit to aid crumpling and then added more color to highlight the highs and lows. Sprayed with Perfect Pearls Mist- Pearl and glued it onto another card-the crumbling shrinks the paper, so I inked up the border and blended that in. 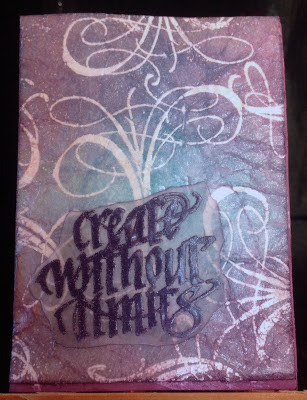 Not wanting to hide the background I stamped Create Without Limits on velum, thermal embossed with a purple power and glued it on with Glossy Accents. I love how the paper gets a leathery look. The flourished crow was VersaMark stamped, thermal embossed clear on white card. 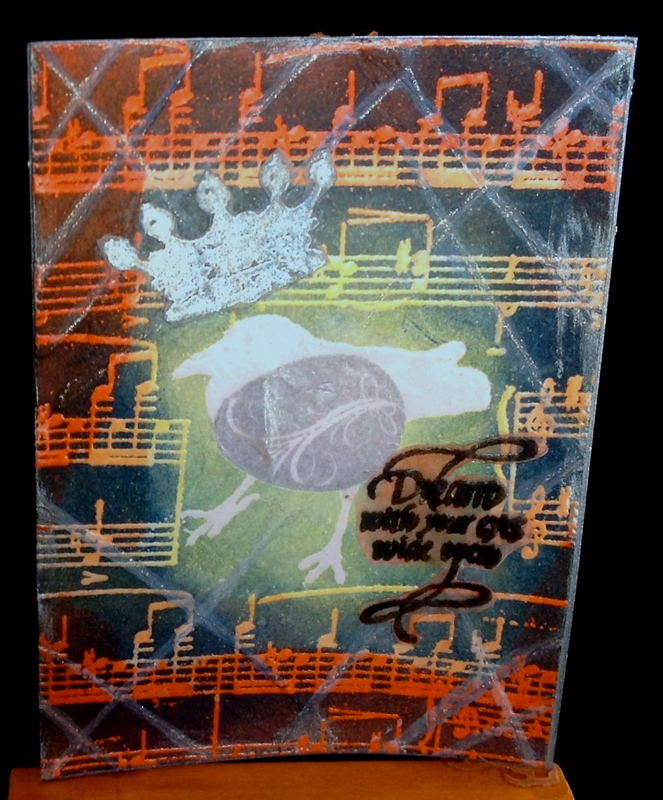 I covered the card with Distress stain- lemonade and pewter, dried it well then stamped the musical notes with VersaMark and embossed clear. Time to crumple. I misted the paper on the back and crumpled and straightened several times till I liked it. Now for the fun- I added first some more yellows, then black soot, and finally chipped sapphire- all with the blending tool. 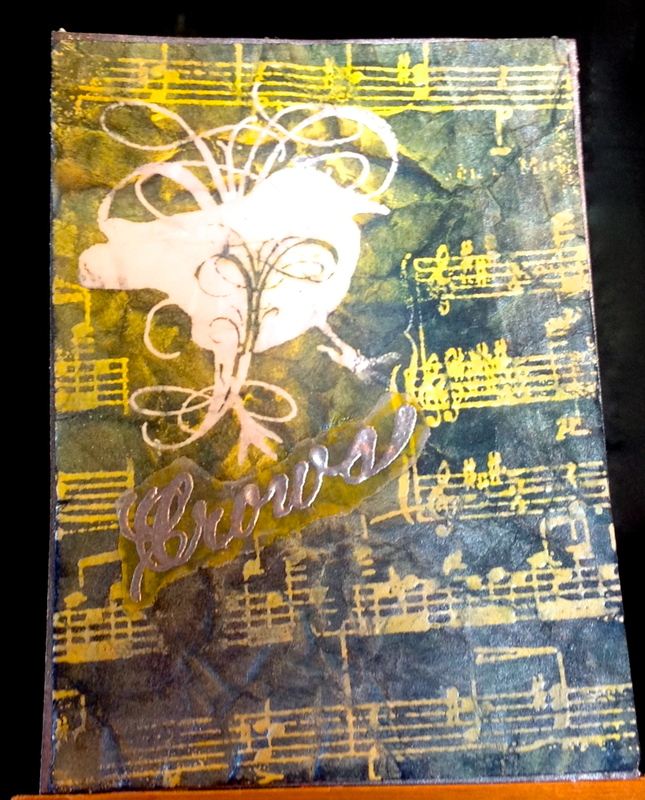 add Crows-themal embossed silver on velum and start on another! This card began with the flourished egg stamped in silver. When that was dry, the small crow embossed clear. Stained the card with persimmon , lemon and mustard, clear embossed the musical notes, blended some more with sapphire and black soot. I fan folded the card, ran Picket Fence stain on the folds, more random blending and when dry highlighted with Stardust pen clear. The one on the left is a random clear, and on the right Ranger detail clear. I recommend you make samples and keep them in a journal or on tags. Saves time and materials in the long run, and I think samples are fun! Comments and questions always welcomed and I'd love to see "what ifs?" you create! Be sure to subscribe to this blog by email so you don't miss the next technique of the Month with Holly March 1! I side folded my white card and ran it through my machine with the Couture Creations "Tied Together" folder, then sponged very lightly with a dirty pink sponge. Stamped the flourished heart onto a piece of Speedball rubber, and cut around the image, leaving a small border. 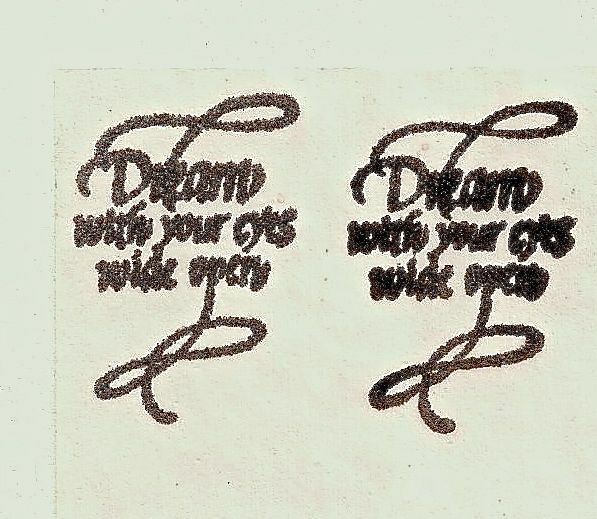 Used this rubber stamp and stamped with Perfect Medium randomly on some white cardstock, clear embossed. Spritzed with some water and crumpled the cardstock several times till I had the creases and cracks I wanted. Dried the cardstock. Sponged with Distress "Spun Sugar", "Picked Raspberry" & "Shaded Violet". Ironed off the embossing between some clean newsprint using a hot dry iron. 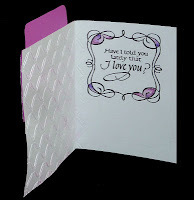 Then stamped the "Flourished Heart" onto one of the solid hearts with the black and clear embossed. Trimmed down to fit my card edges and layered onto a Fuchsia colored cardstock. 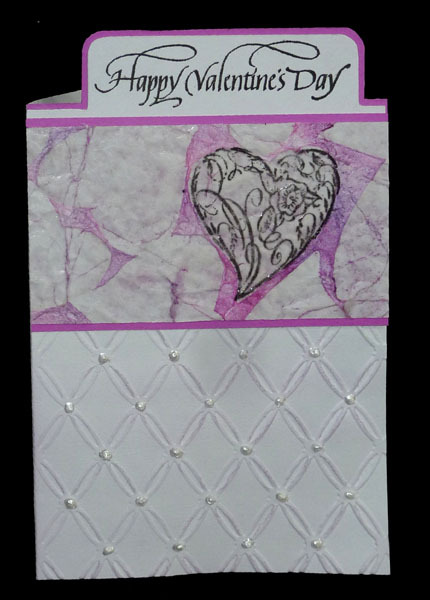 Stamped the "Happy Valentine's Day" with the black on white cardstock, cut it out in a file tab shape and layered on to the Fuchsia cardstock, trimmed that and adhered it to the top of the card, then adhered my resist piece and trimmed to the edges of the card. Stamped the quote and flourished frame with the black and clear embossed both. Then colored some areas with Sakura Metallic Gel Pens, moving the color with a waterbrush. As a final touch, added Liquid Pearls "White Opals" dots on the embossed Tied Together design. Quietfire Rubber Stamps in Print! We congratulate Bibi Lindahl for her article Grunge Resist Part II, in the April 2013 issue of Scrap & Stamp Arts Magazine. Here's a sneak peek at two of the projects that feature Quietfire Design Stamps, along with stamps from Bibi's Nature's Print Shop. An explanation of the technique and instructions for these and other projects are in the magazine. We're excited that Bibi is our Guest Designer for the month of March and we look forward to her first project on the Quietfire Creations Blog on March 10! Thanks for using Quietfire Design stamps Bibi! Bibi's stamps are distributed in the US by Cherry Pie Art Stamps. 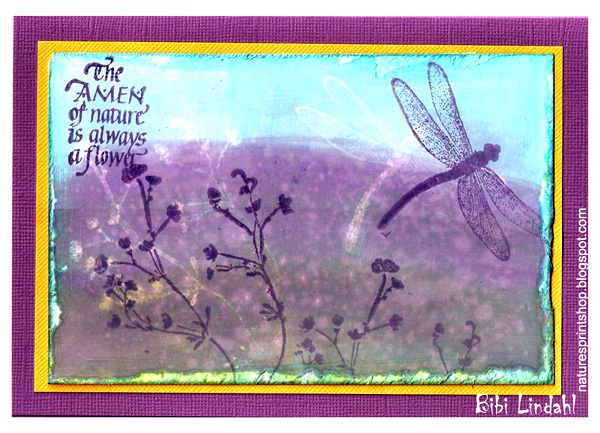 The dragonfly and fairies used in Bibi's cards are from Cherry Pie. 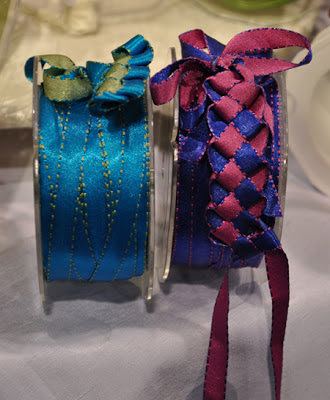 May Arts Ribbons at Quietfire! I fell in love with this creation. I don't know who did it, but I really wanted to take it home with me!! 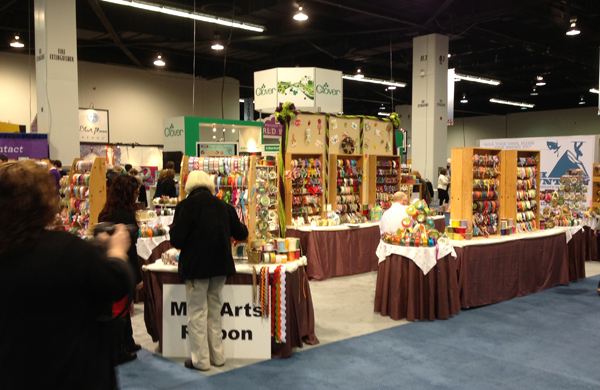 Every year at CHA, I gravitate towards the May Arts booth. The colours and textures send me over the moon. I took quite a few pictures of their booth last year, but this year, I took the plunge and placed an order with them. I was pretty conservative. It's a bit overwhelming! 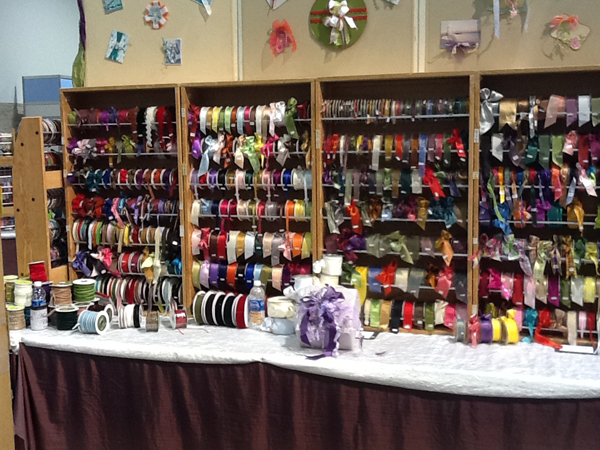 It would be no problem at all to spend many hours here admiring the ribbon. As it was I dragged my poor sales person around and around. I tried to be decisive. Really. Here are two ribbons that I purchased. Unfortunately the blue one was out of stock, but should be here around the end of March. 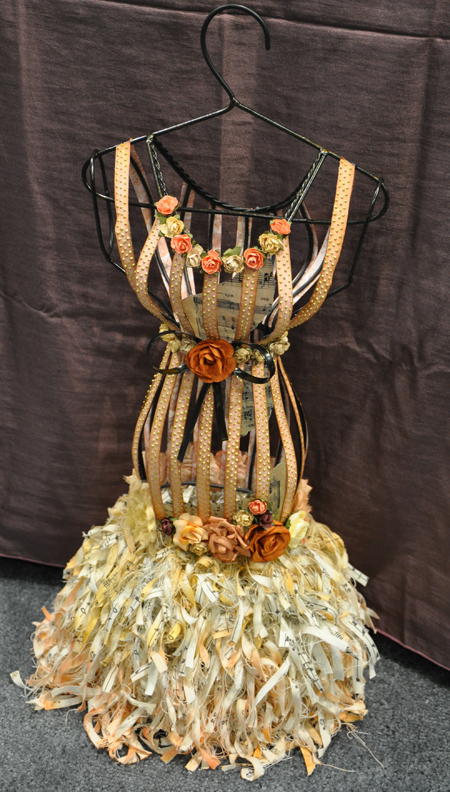 You may see the Quietfire "collection" in the rename category Ribbons and Textiles. Don't forget we have the Becca Bow Maker in stock. Here is this year's booth. Yup, it's like a magnet to me! May Arts has a wonderful blog which is well worth subscribing to! Not all the prizes have been awarded yet. Now it's your turn! Get your friends and family over here to vote on their favourite artwork! You may vote only once for your favourite entry. 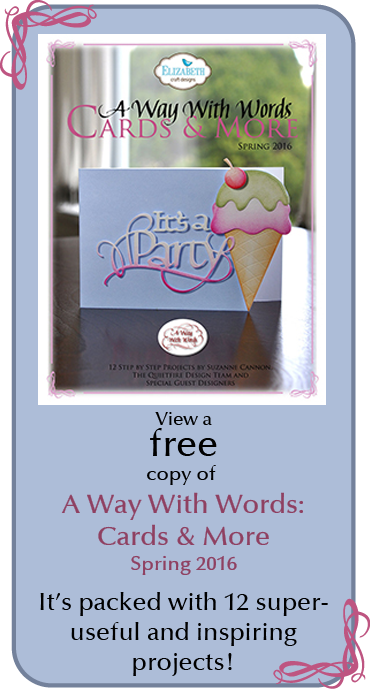 Winner will receive $75 worth of Quietfire Design rubber stamps. The Judges Award will be announced after the Voting winner is announced. Since I've never had voting before I'm crossing my fingers that this works perfectly. I see some people have already voted! How clever of you! You will only see the top three favourites shown at the end and the one with the most votes will be our prize winner. Sometimes said Pooh . . .
Good morning! Sherry here today and I have a chipboard wall hanging to share with you. The base is a page from an old chipboard album that I found in my stash not too long ago. 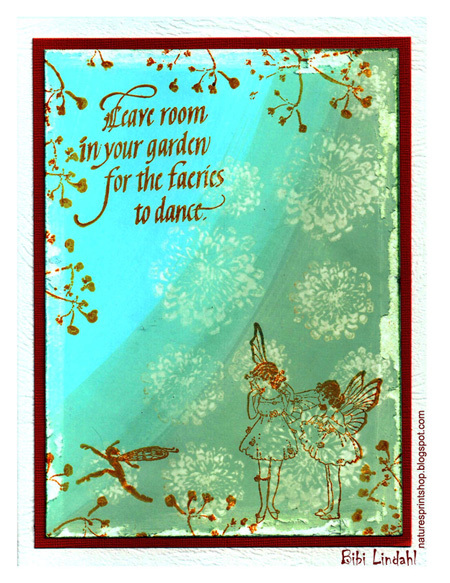 The chipboard page was covered with some papers from the Prima Nature Garden pad, the edges were sanded and then sponged with Antique Linen Distress Ink. The sentiment, Sometimes said Pooh, was stamped on lighter paper from the pad in Archival Jet Black, then die cut/embossed with Spellbinders Ovals. A frame for the sentiment was made using a darker piece of paper and chipboard, which was die cut/embossed with the new Spellbinders Radiant Rectangles. The flowers were made with a pink piece of the Nature Garden pad and die cut/embossed with Bitty Blossoms. The edges of the blossoms were sponged with Victorian Velvet Distress Ink before they were rolled and shaped. The leaves and flourishes were die cut from watercolor paper using Foliage and Venetian Motifs. The leaves were colored with Vintage Photo, Peeled Paint and Forest Moss Distress Stains. Hi again, it’s Joy here with my second post as Guest Designer this month. Today I have some birthday cards to share with you, both using the “Happy Birthday” sentiment from the set: Happy Family Days with Calligraphic Frame (links to products may be found at the bottom of this post). The first card is one that I made for my son for his birthday recently. The patterned papers are from the Bo Bunny Powder Mountain collection, with edges swiped with Distress ink. A circle was cut from the top layer of paper using a Spellbinders Standard circles, and another larger circle to go under the cut out area was cut from plain white cardstock, then stamped with the Happy Birthday sentiment using Versafine Onyx black, and clear embossed. Distress inks to match the paper colours were added around the stamping with an ink blending tool. Be Creative tape was applied to the back of another piece of white card stock, and the Memory Box die Starry Wreath was run through my Big Shot. I have found that I have to use thinner cardstock or the die cannot cut all the way through the card and tape – I also added a shim to the cutting sandwich and ran it through a few times just to make sure! Once cut out, the release paper from the Be Creative tape was removed, and Glitter Ritz Liberty Blue microfine glitter was applied to the sticky surface, and burnished by using my finger. 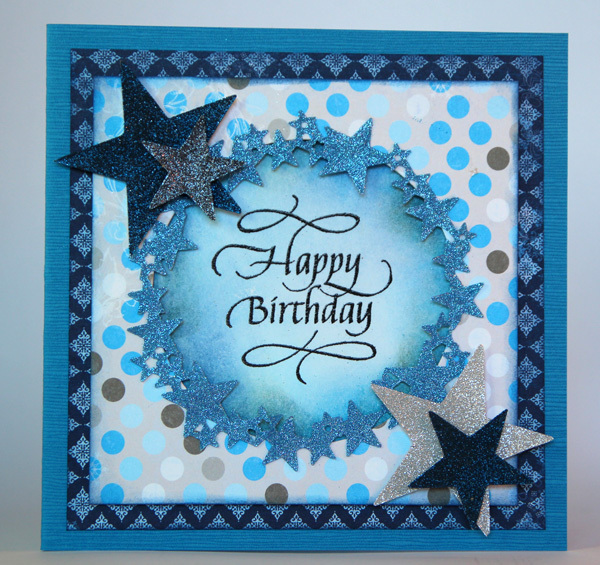 Various sizes of stars were completed in the same way using the Sizzix Bigz die Stars #2 using other colours of glitter. Then the card was assembled with some layers being popped up for depth. A quick and easy card! This would be very easy to produce several in different colours. 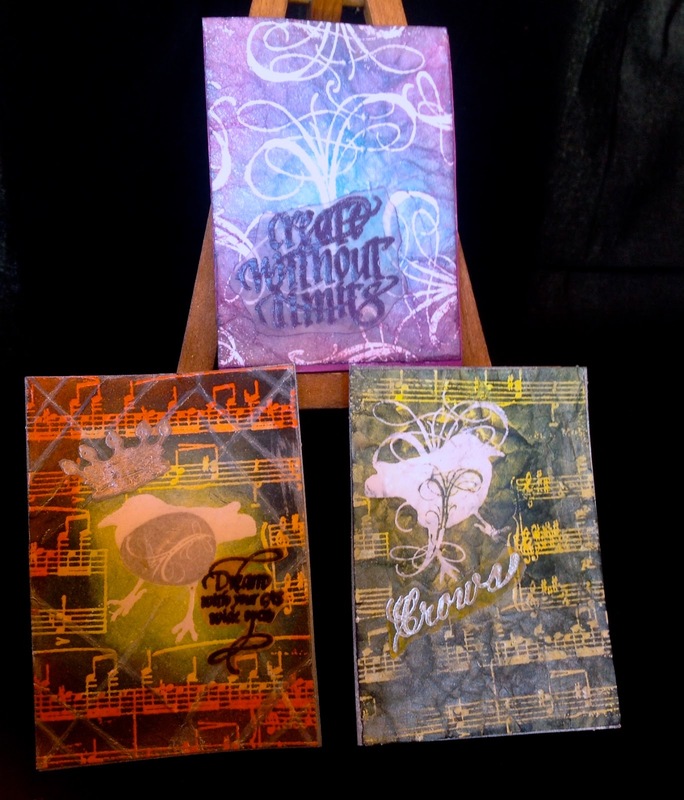 The second set of birthday cards are also quick and easy - once I figured out the design for the first one, I decided to make more using different colour schemes, as it never hurts to have extra cards on hand. I also like to see at how cards can appear quite different with varying colours. Various distress inks were applied and blended on a sheet of white cardstock (I used Tumbled Glass, Dusty Concord, Salty Ocean and Broken China). I then sprayed the sheet with Biscotti Perfect Pearls to add shine and let it dry. I stamped the frame from the set Happy Family Days stamps using Memento Grape Jelly ink, and used a die from Spellbinders Labels 26 to cut out the frame. The Quietfire calligraphic frame will actually fit within a number of different Spelllbinders dies that are similar to Labels One. 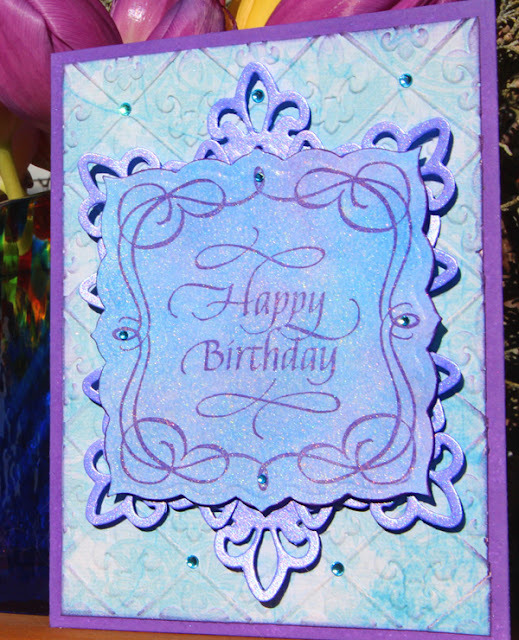 I used a stamp positioner to stamp the Happy Birthday sentiment within the die cut. 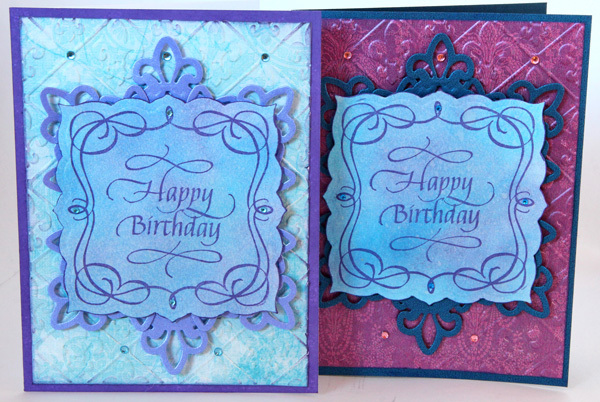 Two die cuts were made from metallic cardstock using a Spellbinders Fleur de Lis Pendant die, trimming the edge of two of the opposite sides on one die cut in order to fit within the card space. 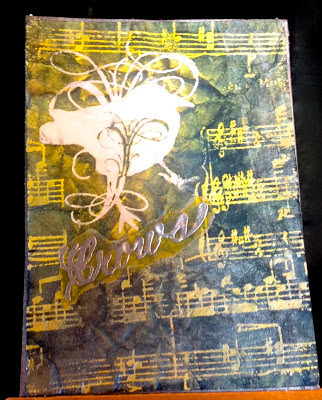 The final piece was the background patterned paper that was run through a Cuttlebug Fleur de Lis Diamonds embossing folder, with the edges swiped with distress ink. Thanks so much for stopping by and I hope I have given you some ideas to use in your own projects. Here is a photo of Joy's card taken outside so you can see the shimmer - so hard to capture with the camera! Thanks very much to Joy for joining us a Guest Designer for this month! She's done a awesome job for someone who is new to sharing her work online! Our Queen of Hearts Winners! 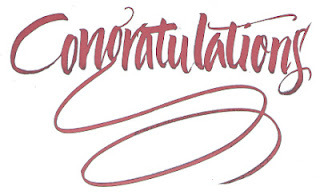 to the winners of our Queen of Hearts Challenge and Blog Hop! Thank you to everyone for leaving your comments and especially those who took the time to create and enter the Challenge! We loved your entries and wish we could give everyone a prize! Prizes will be shipping in the next week or so after all the prizes have been decided. These winners were randomly chosen from comments left on each blog. This is The Queen of Hearts Challenge! Queen of Hearts Blog Hop - Final Day!! Queen of Hearts Blog Hop Coming Soon!